Now that I am no longer officially affiliated with any football teams, I do not mind sharing a few trade secrets with anyone interested. Here is one about taking penalty kicks. This insight came to me during my college years playing varsity football. Some training days, I would stay behind with some teammates practicing our penalty kicks. When there were no goalkeepers, I would volunteer to go into goal. I was officially a winger, but I had been keeping goal in training sessions even back when I was in high school. Now here is the secret. The taker of the penalty, as much as his bone structure and musculature would allow him to be comfortable, should stand as directly behind the ball as possible. A goalkeeper teammate once told me to keep aiming for the upper corners of a goal because these were the most difficult to reach. I agree; but these were extremely difficult to do even with constant practice. 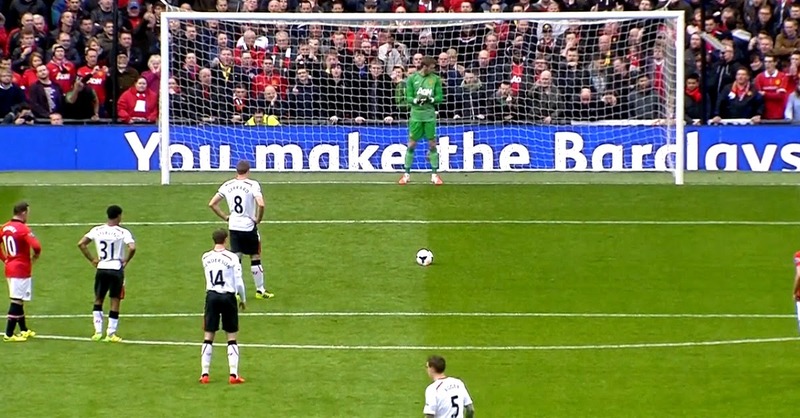 For starters, standing behind the ball does not give away which foot the penalty taker will use, especially if the goalkeeper is not familiar with the preferred side of the taker. A little angle to the side probably will not hurt, depending on which foot the penalty taker will use. However, the wider the angle of approach to the ball, the more predictable it becomes to the goalkeeper where he will place the ball. Goalkeepers may not even be aware of this, but the more angled approaches actually show them where the ball is going. The greater angle contorts the entire body more so that the body language is easier to read. Do not take my word for this. Go watch penalty shootouts, which I have been doing with particular interest over the past decades since these were introduced to settle ties in international competitions. I do not think that there will be any statistics because nobody has really paid any attention to this almost trivial aspect of the game. I am not saying that penalty kicks cannot be scored from an angle. At the end of the day, the placing and pace of the ball – not to mention the confidence of the penalty taker – will ultimately determine whether a penalty kick is converted or not. That said, there is no point in giving the goalkeeper any advantage when – in a penalty shootout – it really should be the goalkeeper who should be at the mercy of the penalty taker. Having watched penalty shootouts in World Cups and other international tournaments down the years, my observations rather tended to reinforce my personal insight. That is, that there were more penalty kicks saved in these shootouts from takers who angled their approach to the ball compared to those who stood almost directly behind it. A penalty also always is an entirely different proposition to shooting in open play, particularly in a shootout. Thus, one needs nerves of steel to be that accurate. Even the slightest fault in the ball’s trajectory automatically gives the goalkeeper the advantage, since he is already standing up and it is always harder to reach down than to reach up. Because goalkeepers need a fraction of a second more to get down, I have always preferred to take penalty kicks low, hard and to the side.